Rapid 105E Electric Stapler. Staples up to 50 sheets at a time. 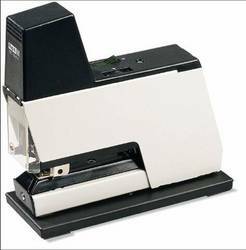 Thin, durable and robust electric stapler suitable for large offices or packaging industry. Variable impact force and adjustable stapling depth. Optional: Pedal and clamp for table mounting. Two or more stapler can be connected in series with fibre optic cable for stapling simultaneously. Capacity: 50 sheets of 80 gsm paper. Loads 210 pcs 66/6-8+ staples. Throat depth: Adjustable up to 100 mm. Quantity: You can always remove it later. You must be a Laidlaw Member to purchase products and see prices. Join Now.